When your appliance isn’t working, you shouldn’t have to wait for fast and professional appliance repair. 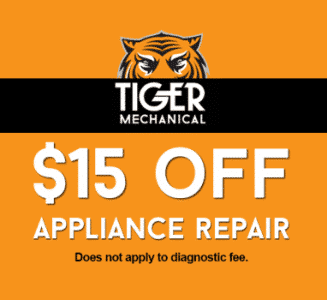 At Tiger Mechanical, we understand the stress that a broken appliance can add to your day. That’s why our Appliance Repair Scottsdale technicians are dedicated to delivering a fast, hassle-free service that you can rely on. We provide Scottsdale with repairs on all major home appliances including refrigerators, ice makers, wine coolers, dishwashers, ranges, ovens, cooktops, washers, and dryers. Our technicians are among the few appliance repair companies in Scottsdale that are factory authorized by high-end appliance manufacturers such as Thermador, Bosch, Gaggenau, and True Refrigeration. As a factory authorized company, we have exclusive access to the manufacturers’ technical support line, training material, and technical directives. This means that we are prepared to tackle the newest technologies on all your appliance models. Fast Service + 5 Year Warranty. Call Now! 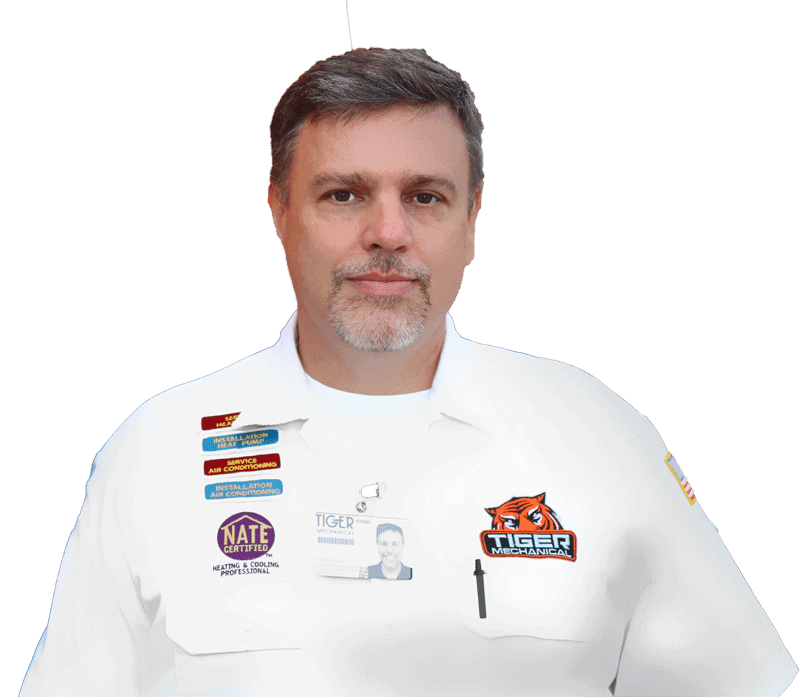 Why Choose Tiger Mechanical for Appliance Repair Scottsdale? 5-Year Parts Warranty & 1-Year Labor Warranty – These warranties ensure that if we’ve repaired your residential appliance and it fails within this time period, you won’t owe us anything to come back out to fix it. Fast Service – Because we know all too well how inconvenient a broken appliance can be, we provide same day or next day service (depending on when we get the call) to get you up and running as quickly as possible. Experienced Technicians – We know you’ll be satisfied with our appliance repair Scottsdale technicians because we are factory authorized with over 25 years of experience. 5-Star Service – Your satisfaction is our number one priority. We promise to do as much as we can to make an often frustrating situation simple and painless for you. A+ BBB Rated – We have the highest rating with the Better Business Bureau for our Scottsdale Appliance Repair services. Fully Stocked Vehicles – Keeping our Scottsdale appliance repair service trucks fully stocked helps us fix your broken appliance fast — often in as little as one trip. You’ll see us coming too! All our service trucks are clearly branded (with tiger stripes, of course!) so you know it’s us. Family Owned and Operated – We love our business because it’s a family. 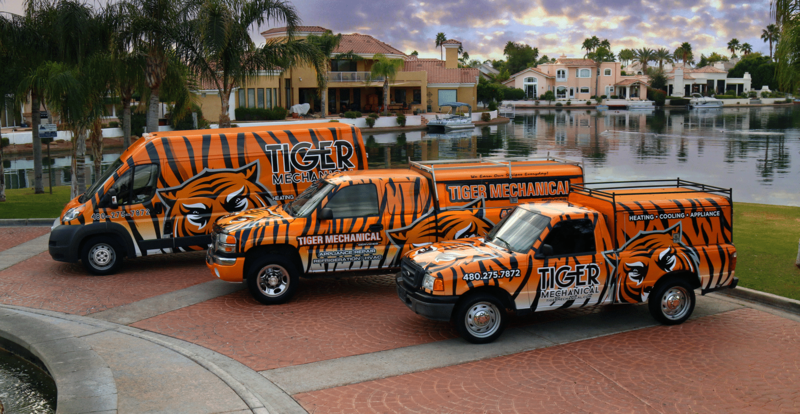 At Tiger Mechanical in Scottsdale, we service both high-end appliance brands and major brands. Whatever problem you’re having with your appliance, we’ve got you covered! Our highly trained and experienced technicians are well equipped to fix just about any appliance repair Scottsdale issue you may be having. From dishwashers to clothes dryers, if it’s broken, we’ve fixed it for someone else before and we can fix it for you now. Find out more about our Scottsdale refrigerator repair services. The kitchen is often the heart of the home, but it isn’t very useful if you have a broken appliance and can’t cook. Luckily, we’re able to get you cooking again! Call us for any service you need including stoves, ranges, ovens, cooktops, and dishwasher repair Scottsdale. Find out more about our Scottsdale oven repair. Appliance Repair Service in Scottsdale, AZ. Providing Refrigerator Repair Service, Washer & Dryer Repair Service, Oven Repair, Dishwasher Repair, and More!